The lying flat option is great for being out and about and not having to worry about how long they’ve been sat up for. There’s a cushion at the bottom to take out as they grow and you can extend the headrest with them too. The hood is really flexible and comes almost all the way over so great for sunny or drizzly days. Fabrics really soft and comfy. Love this product. So easy to use with both the iso fix base and pram and baby always looks comfy. Used it with both my boys. Easy to use, comfortable, nice to look at. 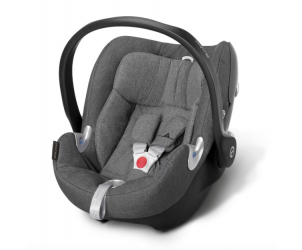 This car seat has been a great buy for comfort and easy adjustment as baby grows. It has an easy to move headrest which also adjusts the straps with it so you aren’t fiddling with different strap height slots. I have this car seat with an isofix base which is really easy to install and take car seat in and out of the car . The downside to this car seat is the weight. I now really struggle to carry the car seat from the car to the house and my baby is only 5 months. 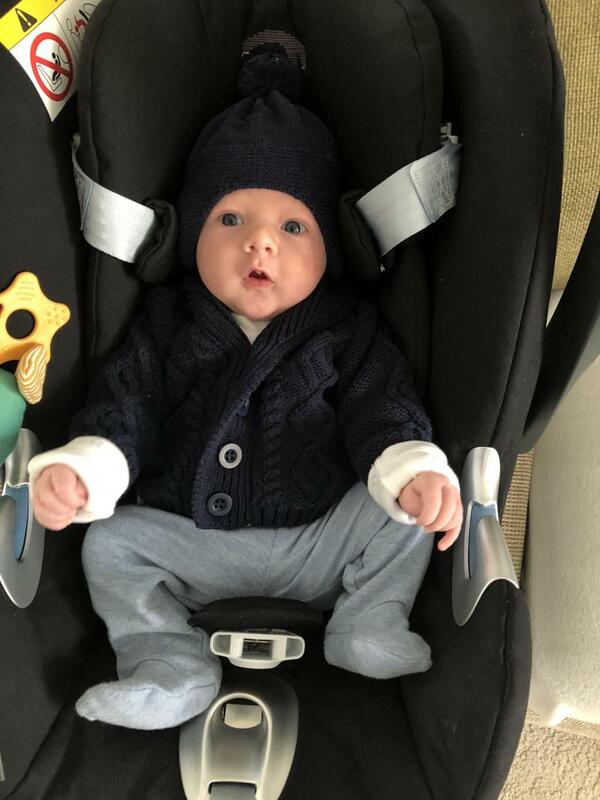 Lovely looking car seat, baby is happy to be in it so must be comfortable. Easy to use and built well. Very comfortable and easy to use. Airbag and all facilities make this car seat very safe. I can definitely recommend it. A lovely looking car seat. Very sturdy and safe, easy and time saving when used with the isofix. Quite difficult to remove from a chassis when using as a travel system and extremely heavy car seat. This car seat is aesthetically pleasing and very sturdy. It clips easily in and out of an isofix base and is also easy to strap in conventionally. I have felt concerned that my daughters head sometimes lolls forward when travelling and I’m unsure if this is because the seat is installed incorrectly or it is not very compatible with our car but it feels like the seat should lie back more. Though it has a head rest which is meant to have 8 settings I don’t find it easy to adjust. My baby gets quite upset in the seat and doesn’t appear very comfortable as she looks squashed. She often arches her back once the seat belt it unfastened which suggested to me that she has felt uncomfortable. It has a good sun shade which folds away neatly. It is extremely heavy and bulky to carry. This car seat is a beautiful design, made incredibly well and very simple to use. It is a good snug 4 point harness car seat which can be fitted with either a dedicated isofix base or belted *. 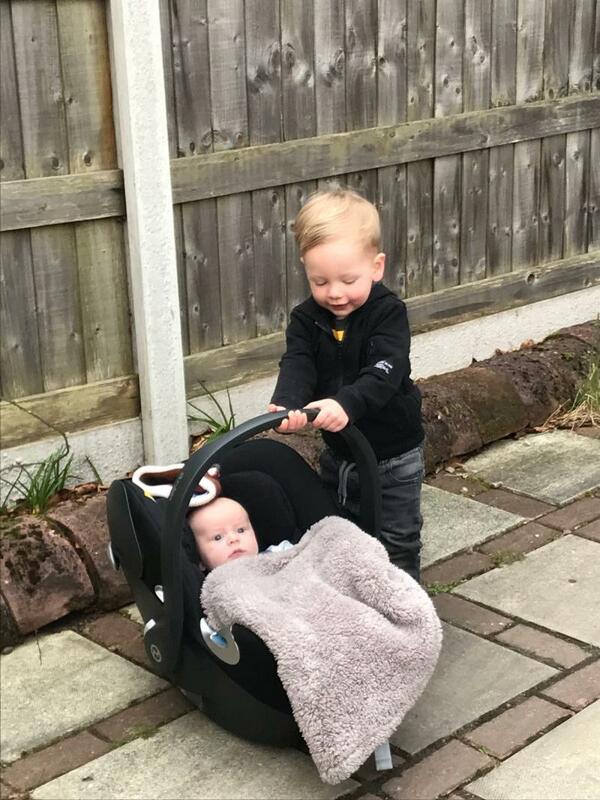 It reclines flat to allow baby to sleep in car seat (NOT when in the car but when stood on the floor or attached to pram frame) which is great for babies developing and growing back/spine. Clicks into the isofix base really easily and has a side impact bar for extra protection. Downsides to the car seat: foremost it is exceptionally heavy..even when empty..so add a chunky baby to it and its quite a strain to lift or carry..but the weight is all the safety features..so you get what you pay for. The * above is an advisory that it does not fit belted into all models of car. It will not fit into a focus without an isofix. Overall though of you're ok with a weight training session every time you carry baby and car seat it's a wonderful product and I highly recommend it. Just check if it is suitable for your car as positioning is critical with any car seat. 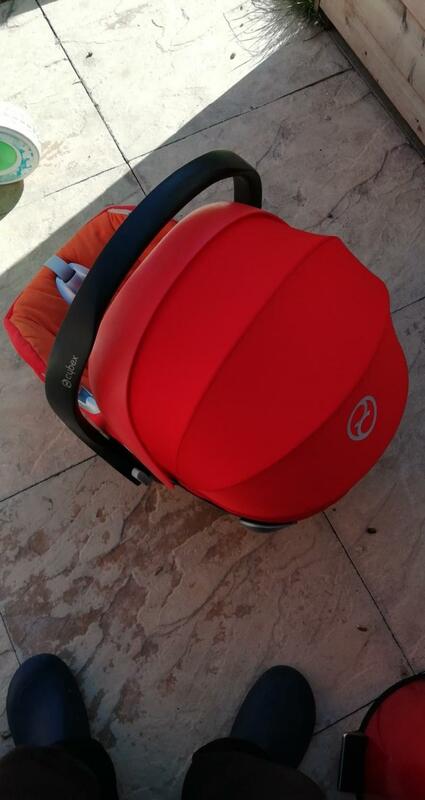 Love this car seat and have so many compliments on it due it being bright orange! It can become heavy once you're little one gets bigger but that's due to its safety. Love the added side impact protection. easy to adjust headrest and harness moves with it so no need for faffing with the harness at the back. Easy to get adaptors for most model of prams which makes it easier to pop into the doctors etc. Nice that it has a hood that you can adjust without having to move the handle! Easy to clip onto car seat base. I received my car seat with a bundle of my mamas and papas ocarro. It’s a lovely looking car seat and very easy to use. The base is absolutely brilliant but the car seat is quite easy to put in without the base too. The hood is brilliant for rides on sunny days. My one weakness is that it seems very snug on my daughters head, which in turn makes her quite hot. I have had this car seat for about 15 months and still love it as much today as I did when I first bought it! Seat was great with a newborn as can be used on our pram in the lie flat position! My daughter always looked comfortable in it! Stylish design and really nice fabric! My daughter still uses this car seat at 15 months old and still has some room for growth! Car seat is heavy to lift but I would not mark it down for this as I think it makes the car seat feel a lot safer that some of the lighter car seats! Would definitely recommend! Heavy, hard to get off the pram & not great for a 3dr car. 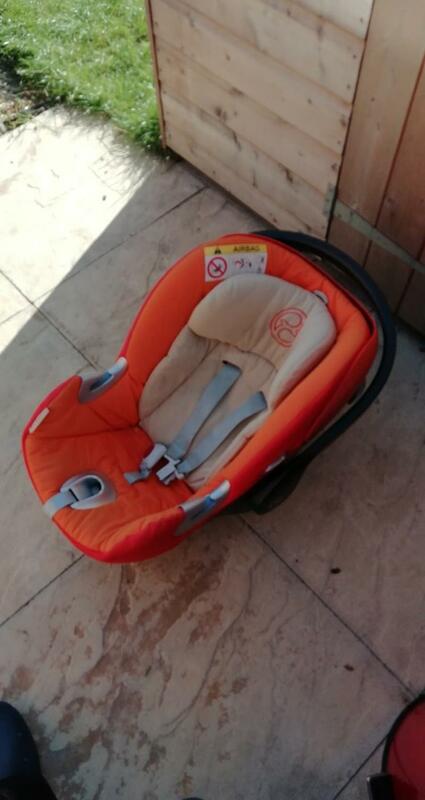 I received this seat as a bundle deal, along with the isofix and the ocarro pram set. Although a great design, I wouldn’t have chosen it separately as it’s very heavy so therefore difficult to manoeuvre in a 3 door car. (Thank goodness for isofix!) I love cybex as a company though, as they have a very high testing standard. It comes with a collapsible hood and can attach to my pram with adaptors, but when trying to lift the seat off of the pram it’s very difficult to 1) simultaneously push down two buttons and lift at the same time and 2) it’s heavy, especially with a baby in the 95th percentile! I would like to add that when receiving the car seat, there was no indication that the instructions were actually stored inside the seat itself at the back. My partner and I purchased this car seat as per of a 6 piece bundle with our mamas and papas ocarro pushchair. The car seat has proven easy to use and little one looks very secure when strapped in. 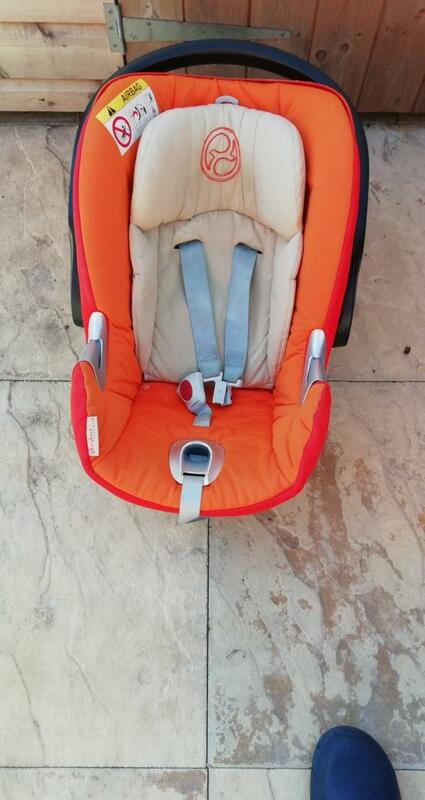 The main issue we have noted with the seat is when attaching it to the pushchair. The seat has clips on either side of the seat to release it from the clips on the pushchair. These are below the base of the handles and the clips need to be held down whilst lifting the seat off. This cannot be done whilst holding the handle and therefore does not feel entirely safe and has on occasion filled me as a new mum with anxiety about the possibility of dropping the seat with little one in it! The car seat is easy to lift into and out of the car and when used in conjunction with the isofix base is very easy to release from the car. We got on great with this car seat from birth. Easy to fit with and without isofix. Baby was comfortable even when older, would highly recommend. Can be used with travel systems with right adaptors too. Easy to use, comfy, safe, loved it! This was baby's first seat, he was always comfy and secure in it, and I felt confident that he was safe even as a newborn. Lots of padding, easy to use harness, heavy to lift (especially after section!) But this is same for all seats so wouldn't mark it down! The Cybex Aton Q Car Seat Group 0+ has been designed with maximum safety and innovation in mind to be an iconic part of the Cybex Platinum range. A new function ensures an ideal sitting angle which enables small babies to lie with their head, neck and chest perfectly aligned. 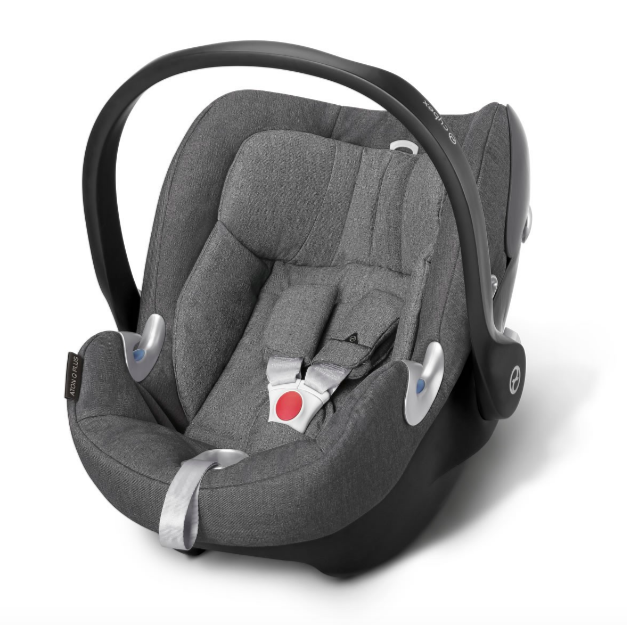 This car seat can be installed either with an isofix base or with a three-point safety belt.